It's Not Work, It's Gardening! 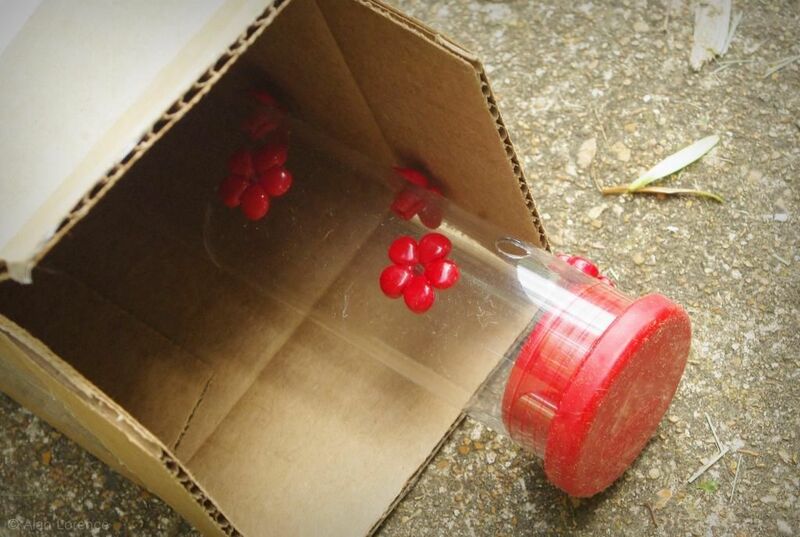 : The future of hummingbird feeders? 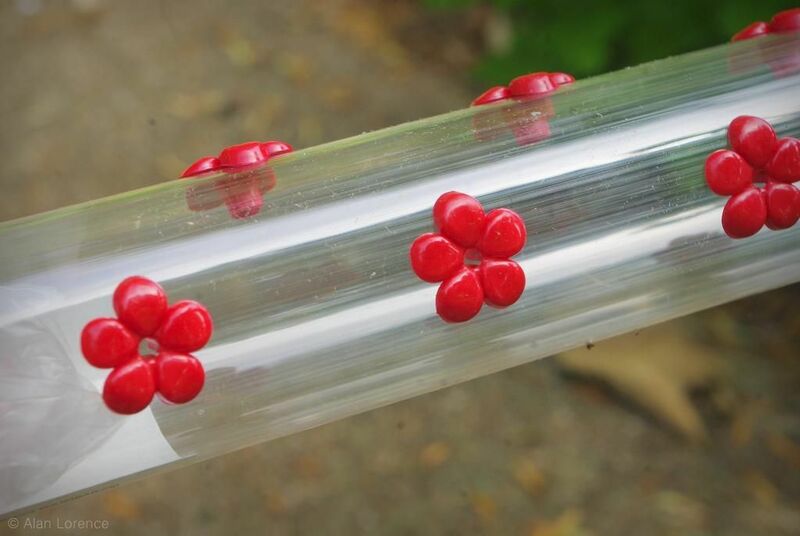 The future of hummingbird feeders? Who doesn't like seeing hummingbirds in the garden? 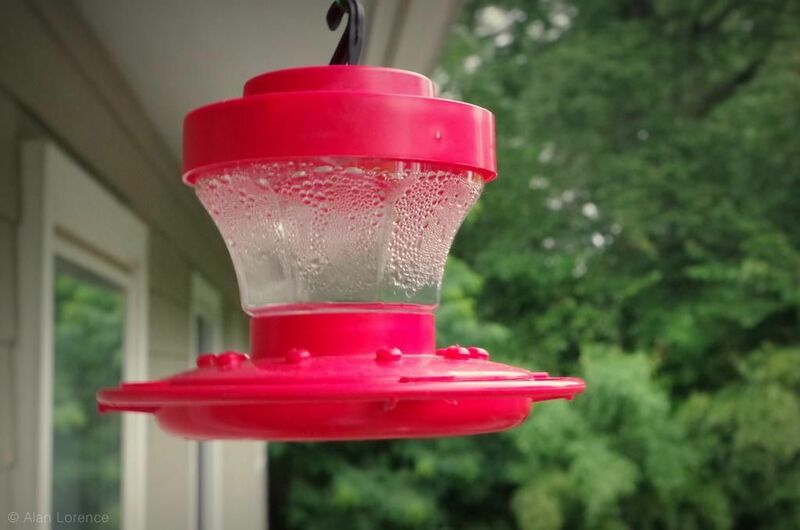 I know I do, and besides planting lots of hummer-attracting plants (Agastaches and Salvias for a start), I've been hanging hummingbird feeders for as long as I can remember. Back in May I had the opportunity to review a new type of feeder, and today's post is my experience with it so far. 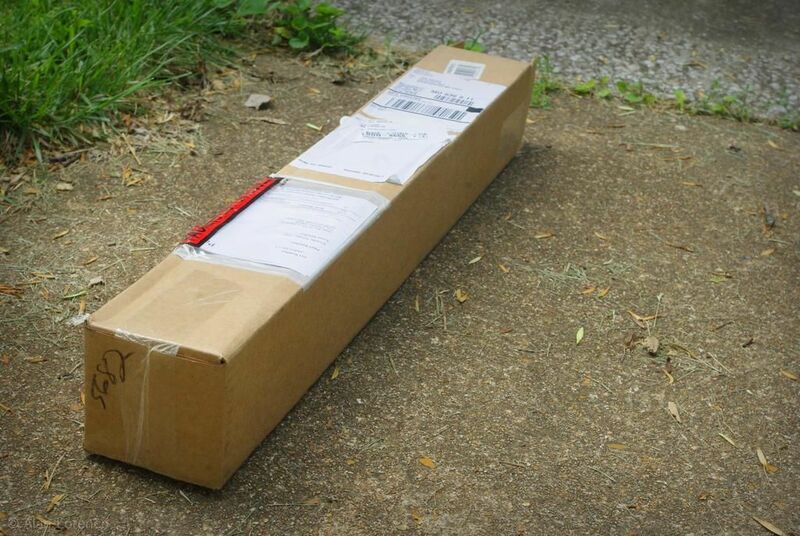 As you can see from the box, this thing must be HUGE! 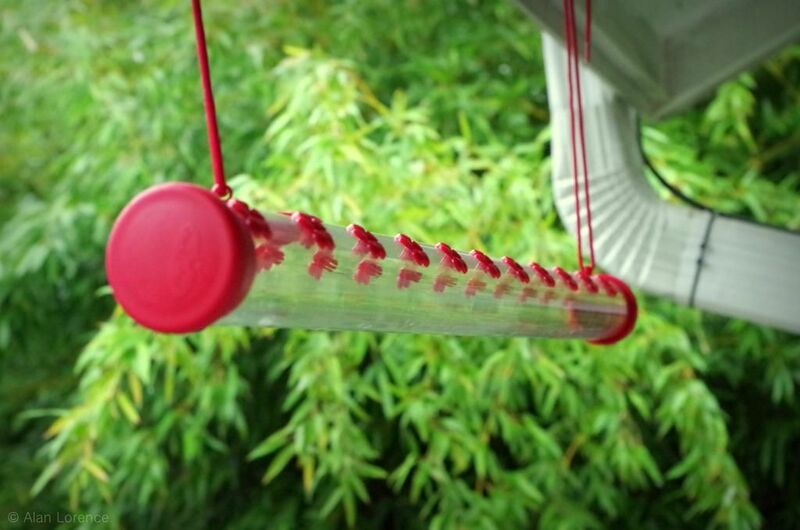 The feeder is a plastic tube, quite long and narrow. 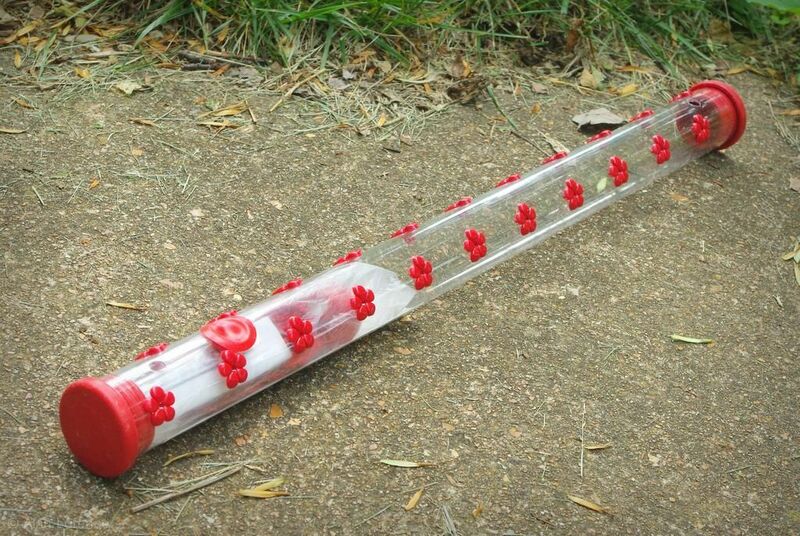 This is the small model believe it or not at 24" (61cm) long, and it has 22 feeding ports. 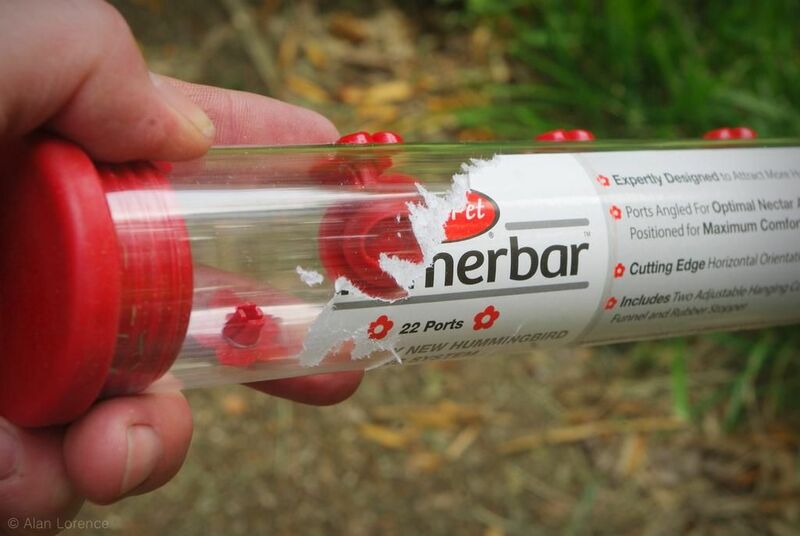 If it isn't obvious, this feeder is intended to be used horizontally! 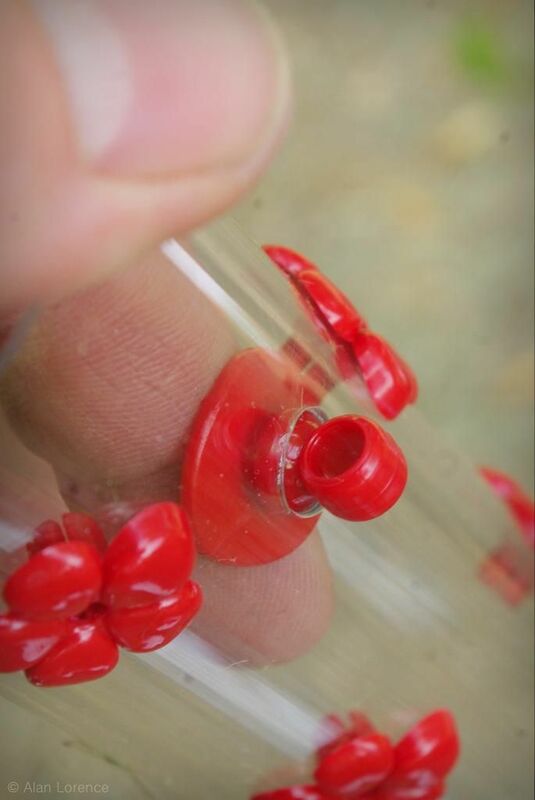 It seemed to me that the clips should have snapped into the holes, but it was such a tight fit I didn't force it. The clips work fine even though they're not snapped in, although they will fall out if I remove the cords. So the instructions were not very helpful. This really should be the type of label that cleanly pulls off. Nothing worse than soaking and scraping and soggy bits of paper in the sink. Hanging the feeder was a bit of a challenge. I had the lines created by the siding for a reference, but you're not going to get the empty feeder level -- it's too light to pull the cords completely taut. 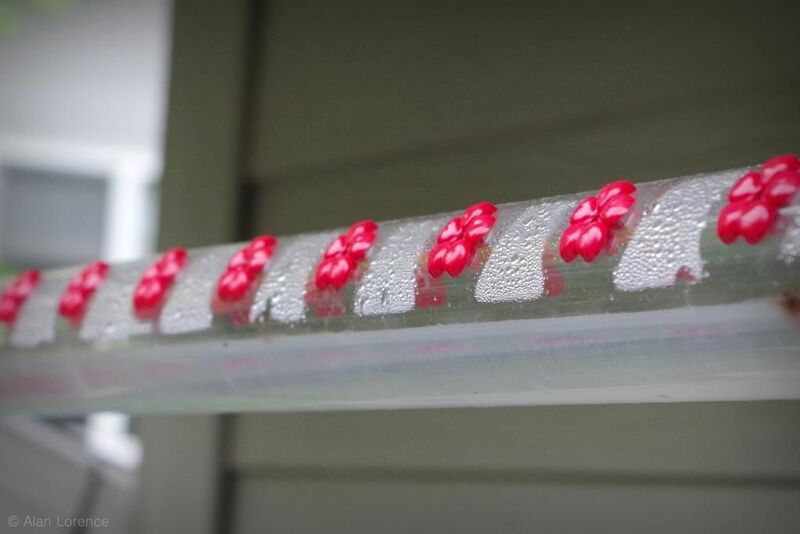 So you're supposed to fill the tube halfway, but even that was tricky. The provided funnel helps but is really too small. Plus I hung the hummerbar at about eye level so pouring the "nectar" into it involved some spillage -- the deck needed a spray down afterward. After getting some liquid into the feeder it will flow to one end -- that's the end you need to raise. I found that adjustments needed to be very small: raise one end a tiny amount, wait for the liquid to settle down, then repeat a few times. Easy to hang, I can fill it indoors over the sink, not too difficult to clean, requires a single hook. Only accommodates one or two birds at a time though, and usually only one. The large version is 4' (1.2m) long -- that must require cleaning outdoors or in the bathtub! The answer so far is: I don't know. I've only seen a hummer at my "regular" feeder once so far this summer, and haven't actually seen any at the Hummerbar. (That doesn't mean they're not out there, I just haven't seen them.) Things usually pick up around here hummingbird-wise in July and August, so I'll post an update later this summer. 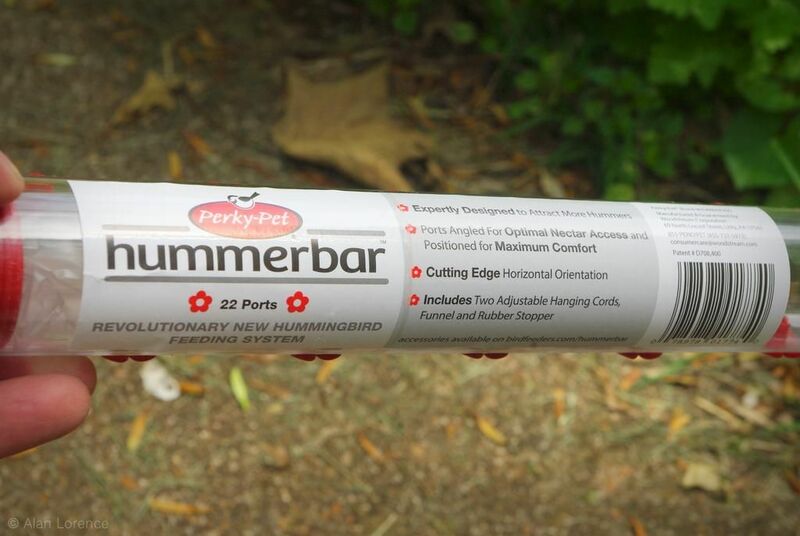 My verdict: if your garden is frequented by many hummingbirds and if you find that they're having a hard time sharing, you may want to give a Hummerbar a try. Be aware that its unique design comes with some challenges though. I received this product for free, but did not receive any other compensation for reviewing it. Wish we had hummingbirds here, such delightful birds! 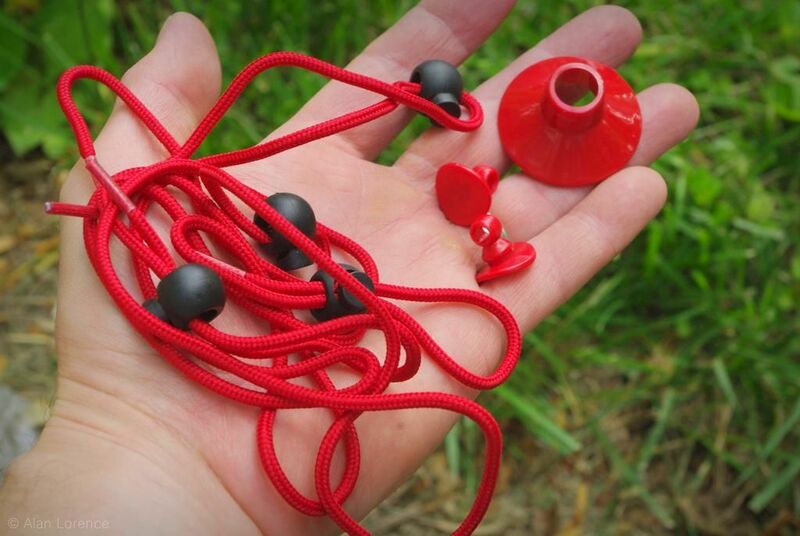 It'll be interesting to see if this attracts more hummingbirds to your garden! 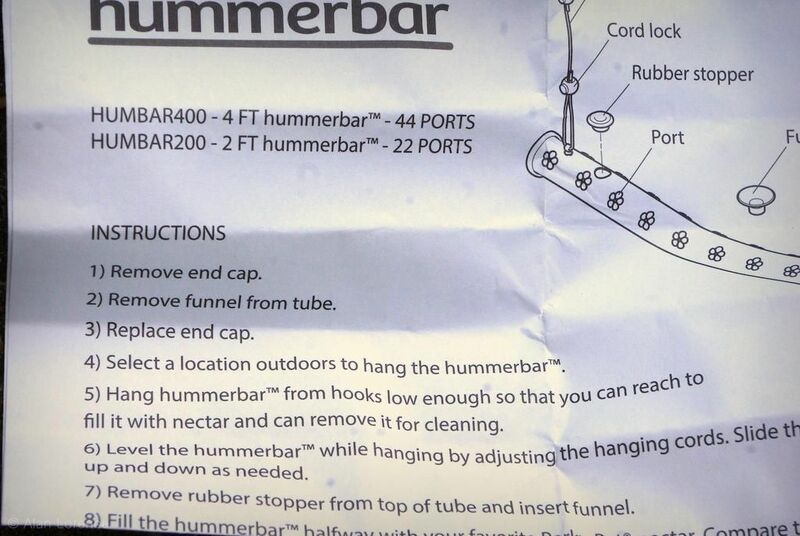 How about hanging it from a horizontal stick that itself has a hanger to another object (pole, etc). Then you could just lift the whole thing (stick and feeder) to clean and refill. Enjoyable and straight forward post. Thank you. If I had enough humming birds around here, then I'd give it a try. I've seen videos of feeders with lots of them sharing. Definitely a creative design idea, but ease of use is an important factor. I'll be curious to see how the birds like it!